There is no place I know of that engenders excitement in me* like airports. They are a true marvel of the modern world. In the space of a few short hours you can, almost magically, be transported from one side of the world to the other. How truly brilliant. And then there is wonder of seeing people from the four corners of the world all in transit if you are in a big airport like Amsterdam’s Schipol, for example. In April of this year, I was in transit on my way to Nuremberg via Amsterdam. Inspired by a Flickr contact’s ( Mimo) recent images from an airport, I had the idea to get a low-down perspective shot of people on those travelators they have. You know the ones you step on to and you do not even have to take a step; you are just carried along. Standing on this travelator in Amsterdam’s Schipol airport, I was caught by the figure in front of me and how cool he looked travelling along this same travelator as I was on. I repositioned the bag I was carrying, so that it would not create an obstacle and got down on my knees, turned the iPhone upside, placed my finger on the button and snapped. Later, I ran it through Instagram and rotated. The result is a very low-down perspective. You can see more of these I posted on my iPhone Flickr account. Funny how things can change. In August of last year, my good Flickr friend, Mark T Simmons asked me to do a feature of the photo I am most proud of for the excellent mobiography website and I chose this image. I still love that shot, but now a few months later, I would choose the shot below as my favourite for April. I love the feeling of losing control, of inevitability that the shot creates. Do you agree? * To be honest, I must say that there is nothing to match the feeling of seeing the light appear through at the top of the steps from the tunnels of some of the very big GAA stadiums in Ireland. The wall of noise and sea of colour that meets you and the knowledge that in the next hour and half or so there will be a ferocious spectacle of skill and courage is unmatchable in terms of sheer excitement. Airports are a little more serene in comparison. 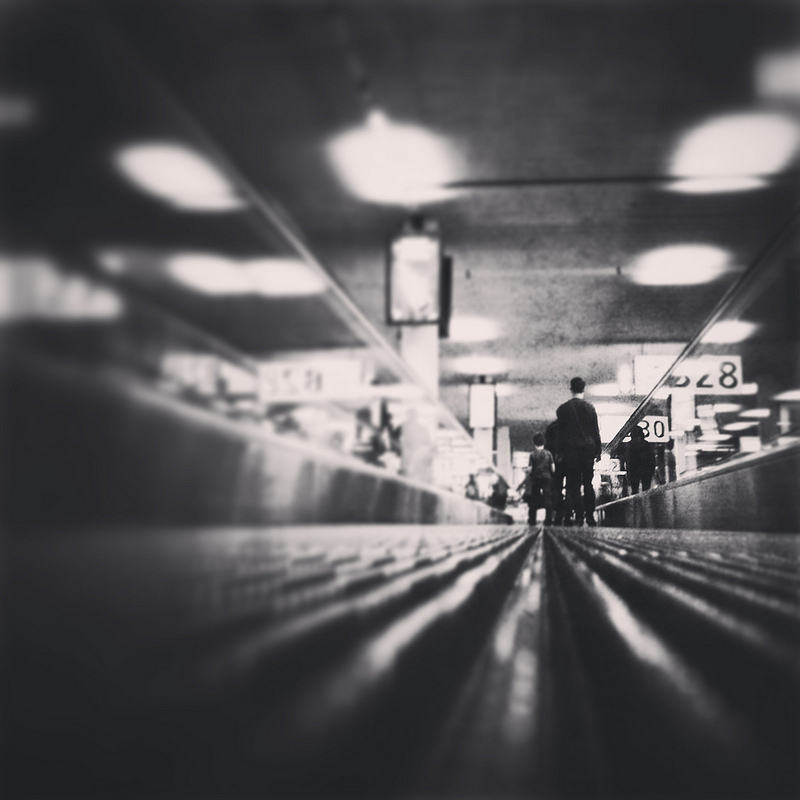 This entry was posted in A Flickr Year, iPhone, My own favourite photographs, photograph posts and tagged Airports, Amsterdam, April 2013, art, Brendan Ó Sé, End-of-year review, flickr, iPhone photographs, iphoneography, Mark T. Simmons, mobiography, people, personal favourites, travel.